Thus far, Far Cry 5’s promotional campaign has downplayed the series’ usual wackiness, focusing instead on the game’s creepy cultist villains. That’s fine, but let’s be honest – most people don’t play Far Cry games for their serious, affecting stories. They play them because wreaking ridiculous havoc is fun. Well, some of you will be happy to know the latest Far Cry 5 trailer and official gameplay video drop the serious front and focus on the mayhem. Get ready for flamethrowers, giant explosions, angry wolverines, and even a killer turkey! The second gameplay video also provides some more information about how Far Cry 5’s Resistance system works. Check out both videos, below. 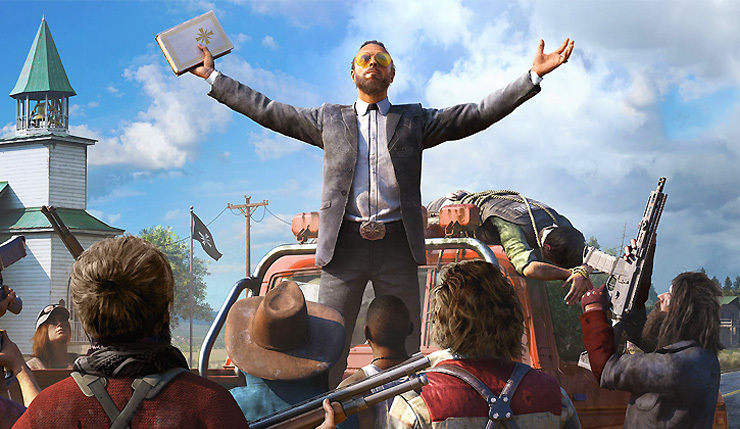 For those who haven’t been keeping up, the ironically-named Hope County, Montana, has been overrun by a doomsday cult called Project at Eden’s Gate, led by the charismatic Joseph Seed. You play as a young deputy sheriff tasked with ridding the county of Joseph and his followers, and you’ll be backed up by a variety of able allies. Past Far Cry games have been somewhat solitary experiences, but this time around Ubisoft is putting a major emphasis on co-op. The odds are certainly against you, but together you and your posse will return Hope County to what it once was, or die trying. Far Cry 5 recently suffered a minor delay. The game will now hit PC, Xbox One, and PS4 on March 27, 2018.